Is AT&T acquiring Time Warner? Time Warner's stock soared nearly 8% Friday on reports that telecom and media giant AT&T may make a takeover bid for the company. A deal would be the latest example of convergence in the media and tech world, and it could usher in another wave of consolidation in the sector. Shares of AT&T were down 3% after the news broke. AT&T declined to comment to CNNMoney, and Time Warner (TWX) did not immediately return requests for comment. Several news outlets cited a range of possible sale prices, from at least $90 per share to $110 per share. AT&T reportedly would use cash and its own stock to finance the deal. It is currently worth $230 billion, while Time Warner's market value is about $70 billion. Larry Haverty, associate portfolio manager with The Gabelli Multimedia Trust (GGT) -- a fund that owns shares of both AT&T and Time Warner -- said he thinks it is "highly likely" the two companies will combine. He added that AT&T could wind up paying as much as $110 a share for Time Warner, which is a price that has also been reported by Bloomberg. That would be almost 25% higher than the stock's current price, and would value Time Warner at more than $85 billion. But any AT&T-Time Warner deal would be subject to a lengthy regulatory review process. That's because an acquisition of Time Warner would cement AT&T (T) as one of the country's dominant media companies, with significant control over both programming and the distribution of that programming. AT&T recently completed the acquisition of satellite TV provider DirecTV, which has access to 20 million households in the United States and also holds the lucrative rights to the National Football League's Sunday Ticket package. AT&T's broadband U-Verse service has another 5 million subscribers in the U.S. AT&T also still owns a huge wireless and landline phone business as well. This is the company many still know by its nickname Ma Bell after all. A purchase of Time Warner would immediately make AT&T a global media giant, on par with cable company Comcast (CMCSA) -- which also owns NBCUniversal and DreamWorks Animation -- as well as Disney (DIS), the parent of ESPN, ABC, Lucasfilm, Pixar and Marvel. AT&T CEO Randall Stephenson has made it known that he wants AT&T to control more programming. And the Comcast-NBC merger has proven that a content distribution firm can thrive by owning a media firm as well. Time Warner CEO Jeff Bewkes is a "willing seller" if he "gets an offer he thinks is fair," Bloomberg said, citing an anonymous source. This isn't the first time that Time Warner has been in play. Rupert Murdoch's Fox (FOXA) made an offer for Time Warner in 2014 but withdrew the bid after it became clear that Time Warner was not interested in a deal. "Wait two or three years," the source said, "and Time Warner will be on the market." Sure enough, two years later there has been anticipation on Wall Street about a potential Time Warner transaction. 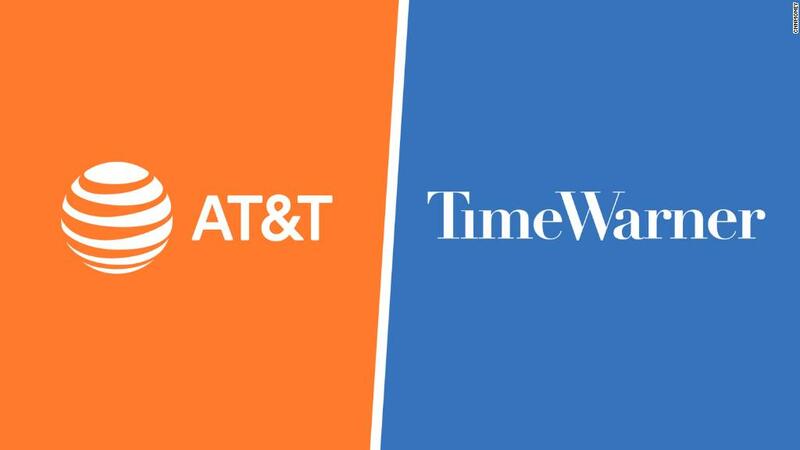 Analysts believe Time Warner's portfolio of entertainment and news businesses are a logical fit with several potential buyers, including AT&T. Gabelli's Haverty said an AT&T-Time Warner would make Stephenson's vision "strategically complete." It is also becoming clear that content can be very valuable to large technology firms as well. There were rumors circulating on Wall Street earlier this year that Apple (AAPL) may be interested in making a bid for either Time Warner or Netflix (NFLX). Google parent Alphabet (GOOGL) and Amazon (AMZN) have also been mentioned in vague trader chatter as possible acquirers of Time Warner or other big media companies. But Haverty doesn't think that one of the big tech firms will buy Time Warner. He notes that software firm Salesforce (CRM) recently faced a shareholder revolt when it was rumored to be seriously considering a bid for struggling social media company Twitter (TWTR) -- and Salesforce ultimately decided against a deal. Haverty said Apple or Alphabet could face similarly disgruntled investors if either proposed a purchase of Time Warner. 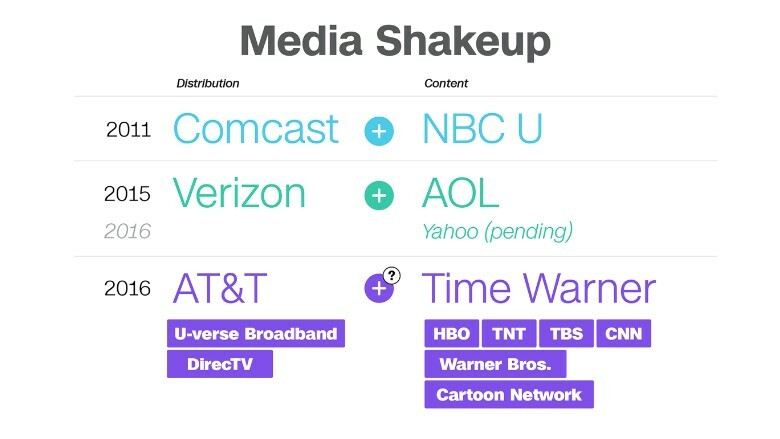 Still, any deal for Time Warner could kick off another wave of mergers in the media sector. CBS (CBS), which also owns the cable network Showtime as well as the Eye Network, is already said to be in talks to reunite with Viacom (VIAB), the owner of the Paramount movie studio, Nickelodeon and MTV. Sumner Redstone and his family control both companies. But Dave Novosel, a media analyst for corporate bond research firm Gimme Credit, noted in a report earlier this month that CBS might be more interested in selling to Time Warner instead of merging with Viacom. "We think that CBS would rather combine with Time Warner," he wrote, adding that "Time Warner would provide an attractive film business, which CBS does not have but presumably would like" and that "HBO would be a nice complement to Showtime." Whether or not Time Warner wants to be an acquirer as opposed to a seller is debatable. A Time Warner acquisition may cause Fox and Disney to consider big deals of their own too. To that end, shares of three other big cable programming companies -- AMC Networks (AMCX), Discovery Communications (DISCA) and Scripps Networks Interactive (SNI) -- all surged Friday as well. If Time Warner is sold, it would mark the end of an era for what was once an even larger media powerhouse. Time Warner controversially merged with AOL back in 2000, a deal that many still view as one of the least successful in corporate history. But under the leadership of Bewkes, Time Warner has spun off AOL (now owned by Verizon (VZ)), Time Warner Cable (now a part of Charter Communications (CHTR)) and the magazine and book publishing unit Time Inc (TIME). "Bewkes has created a pure play content firm that may only be rivaled by Disney. Selling to AT&T would answer the question of what's next for Time Warner," Haverty said.